4th Saturday of Each Month. 5:00PM start. If you live in the Central Valley region of Oregon or Washington, please email one of the contacts listed above and come and game with us. Have you ever fancied your self as an Arm Chair Napoleon, but don't know how to live the fantasy? Do you regret that you ever stopped playing with toy soldiers as a child? Are you interested in military history? Does military strategy interest you? Do you find yourself un challenged by Computer Game AI's? 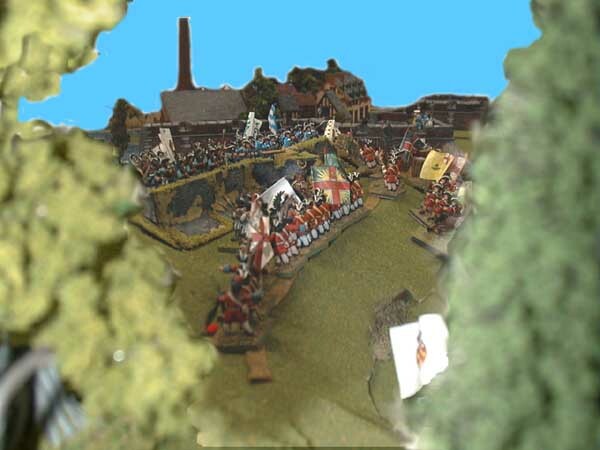 Maybe you are an historical WARGAMER and just don't know it yet. Read on - if you live in Oregon and like the idea - email one of our contacts. A number of EVW gamers turned out for the storming of the Schellenberg. Although the allies took the postition, the cost was so high as to change the historical outcome of the war, and Marlborough himself was seriously wounded at the battle. Show me the game! As there was no club meeting in December, we played a winter battle in Steves garage. We took advantage of the seasonal terrain avaialble form the craft stores at this time of year. Show me the game! This will give you an idea of the games we play. Some of the club memebers from a game in late 2001. Motly crew, though we be, we can guarentee a fun night of gaming. Jack's Command Decision games continue with the international campaign in full swing. I'm requesting that Jack give us a little (or big) write up as to the progress of the campaign with some after battle reports. Jack's Command Decision games are determined by a large campaign game being played via email internationally. The campaign is recreating Operation Barbarossa, Hitler's drive to Moscow. As the campaign produces battles, these are played out using Jacks outstanding collection of miniatures. The results of the game, along with other batlles' game results from around the world, are fed into the campaign statistics, and the war continues. Early 18th Century French and Bavarian battalions march onto the battlefield in this game from the War of the Spanish Succession. With the wide variety of periods we game, it should not be hard to find a game that you will enjoy. Please - email one of the contacts and come and game. Welcome to EVW news page. 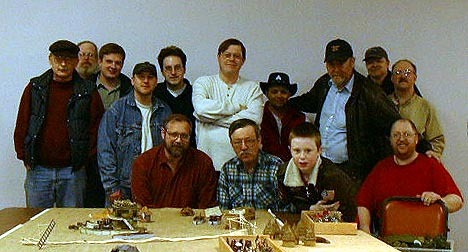 EVW is an informal gaming club that meet once per month, on the 4th Saturday. Our gaming room is at the Eugene Water and Electric Board conference rooms. 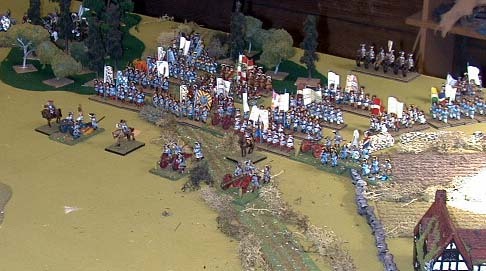 We play games using military models and miniatures to recreate battles from many different periods of history. If you enjoy military history, military modeling or gaming and would like to find out what wargaming is all about, then please email one of the contacts (over on the left side) for more information. We are not in any way affiliated with the Eugene Water and Electric Board, EWEB is just the location of our gathering. Members of EVW have the miniatures to game at least the following periods.